EDMONTON, ALBERTA–(Marketwired – Aug. 15, 2013) – Cantega Technologies Inc., a solution-oriented company and manufacturer of products that improve power system reliability is pleased to announce that it has formed a strategic alliance with Quanta Services, a leading specialized contracting services company that delivers infrastructure solutions for the electric power and natural gas and pipeline industries. 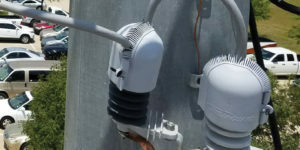 Through the alliance, subsidiaries of Quanta Services will provide product support and installation of Cantega’s patented Greenjacket cover-up products mitigating animal and bird caused outages on distribution systems. This new alliance will see Cantega’s Patent Pending Energized Installation Tools in the hands of Quanta’s professional lineman in all regions of the U.S and available to all customers. “Cantega’s tools enable our trained lineman to safely install the product where cover-up applications are required but outages are not possible,” said Randall Wisenbaker, executive vice president of Operations for Quanta Services. For more information about Cantega’s products, please contact the company by phone 1-877-448-9701 or through their website: www.cantega.com. Cantega Technologies was founded in 2001 by a power lineman who knew first hand that there was a better way to design and build power system protection products and to improve reliability. Marty Niles, the founder with over 25 years experience in the field, witnessed the damage and disruption caused by bird and animal contacts with electrical equipment. He recognized the value of custom-fitting covers as opposed to the common “one size fits all” approach for protective products. He also realized that having covers that could be installed quickly on energized equipment added tremendous value to utilities. In Canada, Cantega’s products are used extensively by AltaLink, BC Hydro, Fortis, Hydro One, Hydro Quebec, SaskPower, Manitoba Hydro and several other regional utilities. Industrial customers such as Shell and Anadarko have also adopted the use of Cantega products where the cost of an outage is measured in lost revenue and can amount to millions for a brief outage. Quanta Services is a leading specialized contracting services company, delivering infrastructure solutions for the electric power and natural gas and pipeline industries. Quanta’s comprehensive services include designing, installing, repairing and maintaining network infrastructure. Additionally, Quanta licenses point-to-point fiber optic telecommunications infrastructure in certain markets and offers related design, procurement, construction and maintenance services. With operations throughout North America and in certain international markets, Quanta has the manpower, resources and expertise to complete projects that are local, regional, national or international in scope. www.quantaservices.com.